When we last chatted, you were falling asleep at my extensively long post about the first two days of our medical marathon. Now that you are awake again, let’s finish this off! Friday Colten and I went back to Ann Arbor again for his FINAL Treadmill Study testing. FINAL!!!! YAAAAAY! While this was a very interesting study to be a part of, it was HARD. 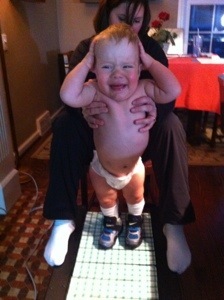 Colten HATED treadmill time and it was no walk in the park for us either. The study, Treadmill Training for Infants Born with Spina Bifida is being done by the Developmental Neuromotor Control Laboratory within the College of Kinesiology at the University of Michigan. The purpose of the study is to assess “the impact of functionally specific, rigorous, and long-term activity, early in life, on the development of their bone mineral content, bone growth, development of muscle control, spinal reflexes, and the ability to step.” The purpose is not to teach the children how to step, but rather to keep them moving and hopefully get them bearing weight which in turn aids in bone growth. Due to limited movement in the lower limbs of children born with Myelomeningocele, bones grow weaker and along a slower trajectory than a typically-developing child. People with Spina Bifida have a high rate of bone fractures and breaks because of the lack of bone density combined with less sensation. For instance, if a person cannot feel his leg and it’s caught or getting bent in an odd position, they wouldn’t be able to feel the discomfort and could proceed to break a leg. So the study hopes to find that the treadmill time increases bone density thus reducing breaks in the future. In order to get data on how the children move, the researchers have the participants undergo a lot of non-invasive testing and evaluating, including a DEXA scan, which measures bone density. So Friday was Colten’s LAST day of all of this. We could’ve done it Thursday after clinic but the researchers and I agreed that after such a long day at clinic he probably wouldn’t give us the best testing on the treadmill. So we returned Friday morning and spent about two hours in the lab building. He did 10 one-minute trials on the treadmill while taped up with sensors, plus some developmental evaluations and a bunch of body-part measurements. By the way, he’s naked during all of this so they can evaluate every movement of his legs so pictures are noticeably absent. Besides the treadmill trials, the research staff also does manual muscle testing and scores each child on a developmental scale. For the manual muscle testing, Colten’s legs are held in certain positions to isolate different muscles and evaluate for testing. The four main muscles of the leg are tested: ankle dorsiflexors (pulls foot up; primarily calls in the muscle on the front side of the lower leg), ankle plantarflexors (points foot/toes down; primarily calls in the calf muscle), knee extensors (straighten knee out; primarily calls in the thigh muscle), and knee flexors (bends knee; primarily calls in the hamstring muscle). These four muscle groups are what the body needs to walk independently. When isolating to elicit a response from each muscle group, a score of 0-4 is given for each the right and left leg. This was a part of the study that really intrigued me from the beginning so I asked the head researcher for a copy of Colten’s results and she provided me with all three! She said to keep in mind it is very hard to do accurate manual muscle testing on infants because they don’t understand what you want them to do with their legs. You have to just hope that you see random movement or can fairly elicit a response. This one was interesting because we’ve never really seen him actively move his right foot. It hangs floppy and moves because the rest of his leg is moving but we’ve never noticed intentional movement. However, it seems the right foot is activated during long stretches, when the other muscles up the leg end up stretching to the point where it moves the foot. So this mostly means he may not be consciously moving his foot but there is SOMETHING connecting the foot to other muscles. The researchers expressed that in their opinion, that’s something to hang onto. Yeah. We knew this. Sad to see the reality of it but we knew this. We’ve certainly seen him pull up his left foot but he’s never pushed down with his feet. When he makes attempts to push through his legs and feet, most of the weight is on his heels and his feet pop up or his legs fall forward. OH YEAH! This kid has quads that kick like Pelé (or more currently, David Beckham; both soccer stars for those that are now lost)! 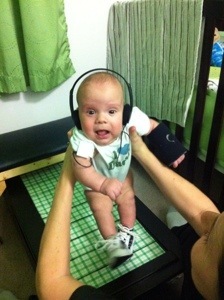 These quads will go a long way to helping him support himself upright and potentially walk. 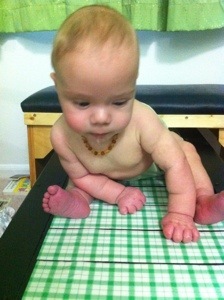 So he gets a LOT of floor play time to encourage him to keep building these muscles. Yikes. We know his hamstrings are weak but it’s kind of deceptive when you watch him. It appears his hamstrings are active to a bystander. But what you actually see is his quad muscle tightening and relaxing, causing the leg to fall into what looks like a knee flexion but it’s really just the knee extensors relaxing. Kind of confusing. Good to know they aren’t totally absent (he was pretty much checked out by this point at the 13-month visit so we aren’t sure if he was overtired or if he had lost movement; pretty sure he was overtired!). I do think I have seen him use his hamstrings a bit more actively in the past month, but to test him here for this muscle, they lay him on his stomach and want him to bend at the knee so the foot goes up. And he does not do that. So no surprise, low scores here. Interesting data. Certainly data does NOT define Colten and what he can do. But it can certainly provide insight, give us hope, show us a little realism too. After all that we made a valiant effort to get him to sleep for the DEXA scan so he would be perfectly still; in the end he was awake for it but they were able to get the critical data from his legs. I am incredibly interested in getting his final reports from this. At the 6-month DEXA, when compared to the initial DEXA at the start of the study, it was found that overall, his bone density in his legs went DOWN. When they dissected the data further, they found his left leg had increased greatly but his right leg had actually decreased so much that it pulled the overall score down. This was heartbreaking to think we had worked so hard (okay, we worked a moderate amount) to get him on the treadmill (even though he really never stepped or pushed through his feet at that age) as often as we reasonably could and his bone density went DOWN. We are really hoping the bone density increases in this second six-month span. Considering all he does with his legs right now – crawling, pulling to knees, sitting and banging them on the ground, etc…we hope this DEXA shows vast improvements! To truly get a handle on comparing the children with Myelo to typically-developing children, the study needs to also get DEXA scans of babies without Spina Bifida (as well as more scans of kids with Spina Bifida). If you are interested in learning more about this study, please SEE HERE. Children must be between 1 month and 18 months of age. It is a one-time scan that is extremely low in radiation – no more than spending a day outside. You receive $50 for participating and you will help a wonderful team of researchers out and hopefully, more and more future children born with Spina Bifida as well. Please consider participating!! Yeah. Can’t do it can you? Hurts doesn’t it?! We are already working with Colten to figure out that he needs to put himself with one knee down and bring one forward and up so he’s in the “take a knee” pose footballers are so familiar with. From there he will use the front leg to push up to standing. We’ll continue working on that because it seems he has finally figured out – HEY! I can go HIGHER! It was exciting to see him work on this yesterday and today! And this week? Just one appointment – physical therapy. Because Richard is off school Wednesday, he will have the opportunity to take Colten and check out his PT digs and meet his therapist. Which means I get a whole week off of taking Colten to appointments! Too bad Colten doesn’t get a break 😉 Little champ! Hope everyone has an enjoyable week and a family and friend-filled Thanksgiving! This entry was tagged motor development, myelomeningocele, treadmill. Bookmark the permalink.